Franchise founder Tim runs the Access4Lofts Plymouth franchise himself! 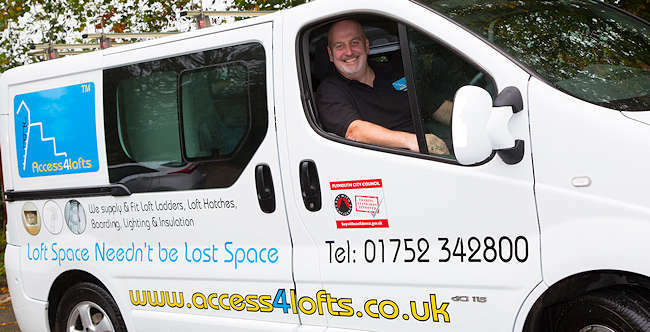 Access4Lofts was founded in 2005 by Tim and Lindsay Brown in Devon. The idea for starting the business came about when they tried, unsuccessfully, to find a company in their area to provide safe and easy access to their own loft. Access4Lofts operated successfully in the Devon area for eight years and, having worked hard to streamline and refine their business model, Tim and Lindsay realised that there was a national need for their service. They decided to franchise the business and provide others with the opportunity to run a similar operation themselves. The pilot operation was a huge success, and there are now a growing number of successful Access4Lofts franchisees across the UK, who are all following Tim and Lindsay’s system with great results. As they have personal, hands-on experience of setting up and running the business, Tim and Lindsay strive to offer unparalleled support to their franchisees, enabling them to concentrate on growing their businesses and enjoy the excitement that the opportunity brings, without getting bogged down with red tape. New franchisees attend a four-day, residential course at Access4Loft’s Head Office in Devon, where they are led through the technical side of the business, marketing, business management and receive training on their bespoke quoting and marketing system. Tim and Lindsay are confident that, once franchisees have completed their comprehensive training, they are ready to hit the ground running and will be fully prepared to start building their own, successful businesses. Could you be Access4Loft’s next franchisee? Call them on 01752 342 800 or click here to visit their website and find out more.